I remember the holy place Ethiopia the father and mother of all dynasties were Gods ruled as kings. Ababonaabakulu basekhemu, lord khemu teaching our ancestors ‘you are the light let it shine’. I remember how later greed, anger, jealousy, and bloodshed turned our world upside down, honor was lost respect, truth and love became a myth, when Eden was ripped, robbed and rapped and her people and their story were destroyed, distorted and disfigured. I remember you Yaa Asantewaa mother of the queens protector of the throne, I remember you queen Nzinga princess of worioresses,I remember you Nanny and Queen Nayavingi mothers of the mountains defenders of the faith, I remember you Sojourner Truth mother of Godly wisdom, I remember you Harriet Tubman angel of courage the Black Mosses and I remember you Lillian Ngoyi and Dora Taman sisters of justice. You beast I remember for the mind of the female slave now moves on its own axis, I take back my mind and my body healing my womb from all kinds of sickening rapes, restoring life back to my off springs I refuse to deliver any more of springs to your altars of death, like a lioness, Im ready to kill for my off spring for I remember and know that from my destiny I will run no more for the blood of Priestess Nehanda, Qelhata and Geraheni flows through my veins empress Mennen Empress Taytu Betul royal mothers of the throne and Worrioress Amina runs through my veins, like Nomkubulwane this river must run its course and beware if your house is built on sandy land by the shore. What makes a man I ask? Africa, I have travelled you up and down. Is it pride, dignity or a soul? I am woman. Sister. I am who I am. Thobekile Mbanda is a young gifted woman from Inchanga Kwa Zulu Natal now residing in Cape Town. She is a spoken word artist and community activist. Her work portrays her deep rooted passion for the well being of her people, promoting self-love, self-respect, identity and self-sustainment. Her guitar inspires her lyrics and flow and is her companion. 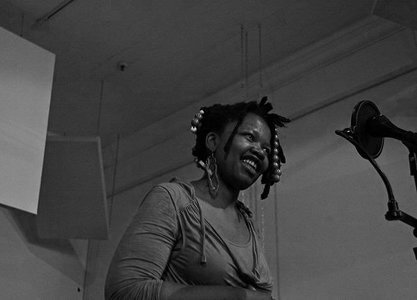 She holds high respect for poetry for she sees it as a catalyst of reaching the consciousness of the people who dare listen and considers herself as the voice of the beginning Thobekile wase Embo. She sees her work as a sacrifice of love for peace, unity, honesty and freedom for all.